A window-shaking shout-out for those times when you know you can’t arrange for someone who screwed you over to die a fiery death in a starship explosion…but it sure is cathartic to think about for a moment. At the graveside of George’s fiancee, Susan Ross, Jerry stood nearby with Mr. and Mrs. Ross (while George “mourned”). 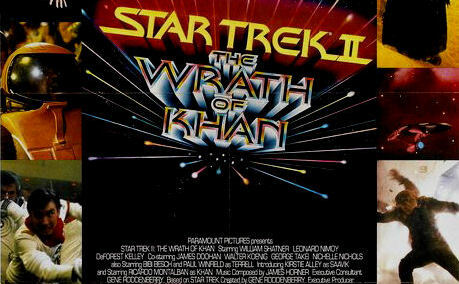 “She’s not really dead,” Jerry told Susan’s parents–quoting Star Trek II: The Wrath of Khan–“if we find a way to remember her.” When the Rosses’ way to remember Susan came to be–a philanthropic foundation with George on the board–Jerry’s remark incurred the Wrath of George against Khan–er, Jerry. How you react to someone who screws you over ranks right up there with the most important decisions you’ll ever make in life–because, ultimately, you must act decently. (After all, we do live in a society.) George demonstrated for us one measure we might take: yelling at the top of your lungs in public. You might yell at the abstract World, but in this situation that’s not sufficient. Better to yell the name of the person you’re deriding. But since life doesn’t really work like that–that’s the stuff of movies–better to yell a fictitious name, like one from a movie. Because to quote a movie that fits a life situation…that’s the stuff of life. An awestruck observation for those times when you don’t know where you are, but you’re not lost. Nooo. Because that’s not how you see it. Kramer ventured beyond his little world in New York City to maintain his “long-distance relationship” with a girlfriend who lived downtown. Eventually losing his way, he called Jerry, who told him to look for a street sign. And there it was: 1st and 1st. His epiphany at the sight sounded less like he’d found his place and more like he’d found space…the final frontier. Watching the voyage of the Starship Kramerica Enterprise from I’m walkin’ here! to I need a little help here! should bring an encouraging signpost into view: we’ve all been here. It’s what you do when you get there, though–that makes all the difference. You might resign yourself to being lost and ask for help. Or you might say “Get lost” to those who tell you to ask for help. But if you really want to get your bearings–and keep them–look at all the world around you as your little world. By taking such a Kosmo-politan view, you’ll never be lost because you’re always at the center of things…always seeing signs, not stars. Your every wrong turn will be a revelation; every misstep a chance to map that site and move on.